The 2019 Blue Bunny Helmet of Hope program will launch later in the Spring. If you’d like to receive an email when the program launches, CLICK HERE. Nominations were accepted from noon EDT on Sunday, March 18, 2018 until 5:00pm EDT on Friday, April 20, 2018. Nine (9) nominations will be selected to move on to Round Two. The 10th charity has been selected by Blue Bunny. 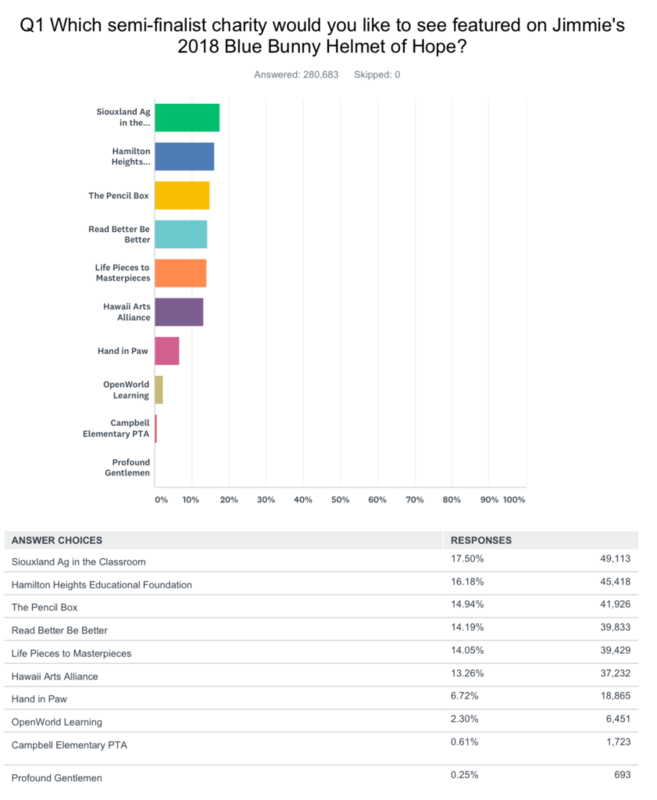 The public voted for their favorite charity from the ten (10) semi-finalists selected in Round One. The five (5) charities that received the most votes between May 8-May 15 will be featured on Jimmie’s Blue Bunny Helmet of Hope on July 14 at Kentucky Speedway. In addition, these five (5) charities will each receive a $25,000 grant and a Blue Bunny Ice Cream party. During the Round Two Voting period, only votes submitted from this webpage will be counted. Individuals can vote multiple times, but cheating WILL NOT be tolerated. The use of automated voting is strictly prohibited. Any IP address flagged as even potentially using automated voting will be blocked and all votes associated with that IP address will be disqualified. No exceptions. Voting was open from 12:00pm (noon) EDT on Tuesday, May 8, 2018 until 5:00pm EDT (extended deadline) on Tuesday, May 15, 2018. In order to be eligible for the Blue Bunny Helmet of Hope, charities must directly support K-12 public education through existing programs and activities. Organizations that do not directly support K-12 public education are not eligible. Schools (public, private, parochial, etc) are not eligible for this program. We encourage K-12 public and charter schools to consider our Champions Grant program and/or our Team Up For Technology program (eligibility restrictions apply). In its eleventh year, the Blue Bunny Helmet of Hope program gives fans and consumers across the country the opportunity to nominate their favorite charity that supports K-12 public education for the chance to be featured on seven-time NASCAR Cup Series Champion Jimmie Johnson’s helmet for a predetermined race during the current NASCAR Cup season. 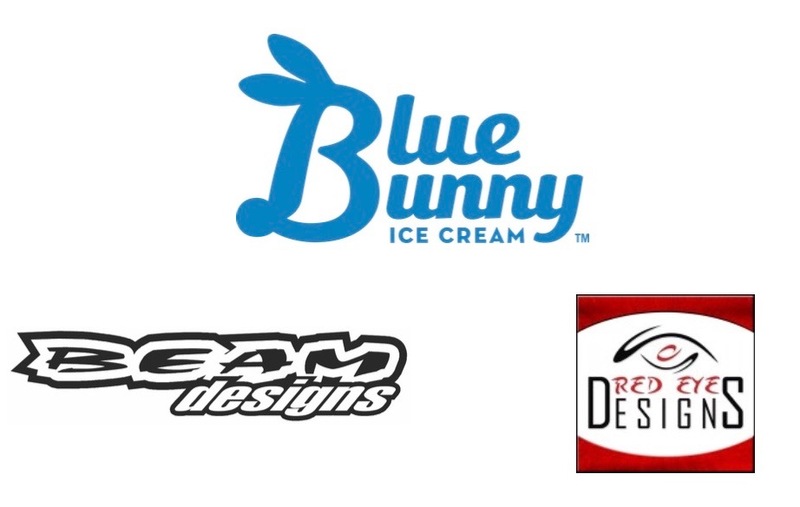 The title sponsor for Helmet of Hope program is Blue Bunny Ice Cream. In addition to being featured on the helmet, each charity selected also receives a grant of $25,000 and a Blue Bunny ice cream party. To date, the program has contributed more than $1,200,000 to 111 different charities. CLICK HERE to read the press release announcing the 2018 recipients. CLICK HERE to see a complete list of past recipients by YEAR. CLICK HERE to see a complete list of past recipients by STATE. Please Note: Past recipients of a Blue Bunny Helmet of Hope grant are not eligible to apply. Questions? Please complete the form below or call (704) 586-2996. Please DO NOT submit nominations or votes via this form as they will not be counted.